During the eighteenth and nineteenth centuries, carpenter trade associations in various cities developed confidential publications that listed the prices members charged for their services, from framing houses to building fences. Referred to by various names—Carpenter Rule Books, Books of Prices, Builders' Guides, Architect's and Builder's Pocket Companions—these publications served the interests of the tradesman and his customers. Association members received consistent pay for their work, while clients were assured that they were billed fairly for the carpenter's services. The books were used for measuring and preparing bills for completed tasks as well as for estimating proposed tasks. The majority of information provided in each publication consisted of columns noting the type of work undertaken (constructing stairs, doors, window sash, or shutters; making and installing wainscoting and mouldings; etc.) and a corresponding list of prices per foot, yard, or square (100 square feet) of work. The earliest known American price book dates to circa 1750 and was used in Newport, Rhode Island. By the turn of the nineteenth century craftsmen in cities throughout Massachusetts, New York, Pennsylvania, and Maryland had published their own versions. As the nation expanded westward, carpenters brought along existing rule books and published new ones. In the 1820s and 1830s, carpenter rule books were being used as far west as Kentucky and Illinois. Research has turned up more than seventy editions of rule books published (though more likely existed) before the practice trailed off in the mid-nineteenth century. Some books, especially for organizations in larger cities like Boston and Philadelphia, were repeatedly updated to address economic fluctuations and changes in architectural fashion. 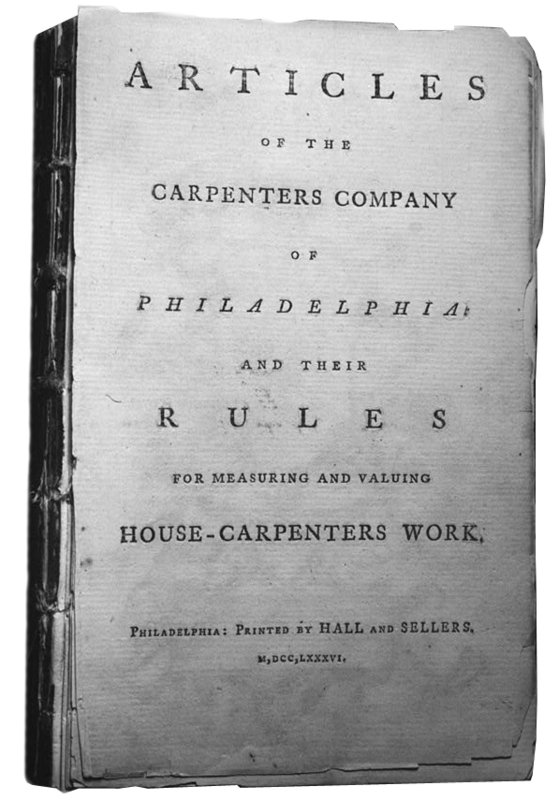 For example, the Carpenters' Company in Philadelphia reissued its price book in 1786, 1805, 1831, and 1852. Rule books have long provided insights into the development of American architecture from the Colonial period to the Civil War. They reveal variations in local building practices and the terms used to describe them across time and place, and illustrate a historical succession of architectural styles and details. Specific editions contain rules for other trades, mention local builders by name, or include handwritten annotations. Lee Nelson and Orville Carroll gathered copies of many of the rule books from archives across the United States, conducted research on the topic, and commissioned other studies and bibliographies. HPEF is pleased to provide materials from the collections they assembled and share them through this website.